Cattails grow in nearly all types of wetlands, wherever there is adequate sun, plentiful nutrients, and soggy ground. Midway between land and water, freshwater marshes are among the most highly productive ecosystems on earth, rivaling the tropical rainforest. People valued the supermarket of the swamp for the cattails, but also as a rich source of fish and game. Fish spawn in the shallows; frogs and salamanders abound. Waterfowl nest here in the safety of the dense sward, and migratory birds seek out cattail marshes for sanctuary on their journeys. The two most abundant species of cattails in North America are Typha latifolia (common cattail) and Typha angustifolia (narrow leaf cattail). T. angustifolia may have been introduced from Europe. The two species also hybridize to form Typha x glauca. There are about 30 species in the genus Typha, and they share the family Typhaceae with just one other genus. 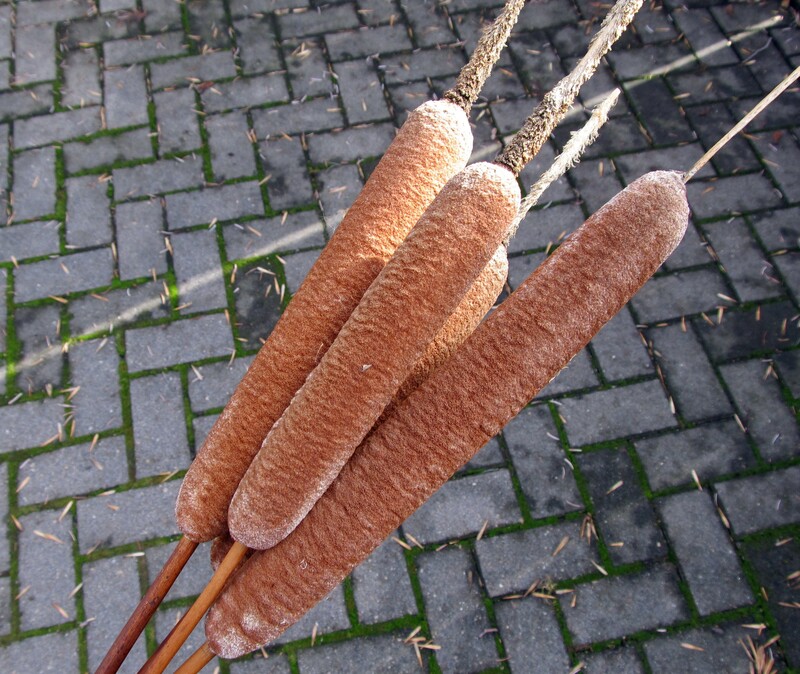 The common names for cattail are nearly as abundant as the plant itself: candlewick, water sausage, corn dog plant, cossack asparagus, reedmace, nailrod, cumbungi, etc., etc. Cattails have long, upright, blade-like leaves. As they approach the base of the plant, the leaves wrap around each other to form a tight bundle with no apparent stem. As Kimmerer puts it, this arrangement enables the plants to “withstand wind and wave action” because “the collective is strong.” Flowers appear on a tall stalk that reaches up towards the tops of the leaves. The inflorescence is composed of hundreds of separate male and female flowers. Male flowers are produced at the top of the stalk and female flowers are found directly below them. In the spring, the male flowers dump pollen down onto the female flowers, and wind carries excess pollen to nearby plants, producing what looks like yellow smoke. 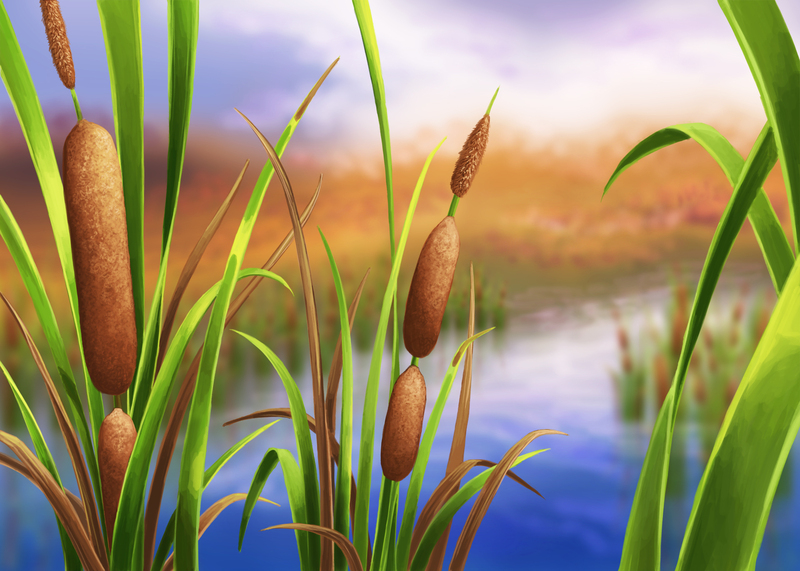 Because cattails spread so readily via rhizomes, prolific airborne seeds mostly serve to colonize new sites, away from the thick mass of already established cattails. The ability to dominate vast expanses of shoreline gives cattails an invasive quality that often results in attempts at removal. Various human activities may be aiding their success. Regardless, they provide food and habitat to numerous species of insects, spiders, birds, and mammals. A cattail marsh may not be diverse plant-wise, but it is teeming with all sorts of other life. Ethnobotanically speaking, it is hard to find many other species that have as many human uses as cattails. 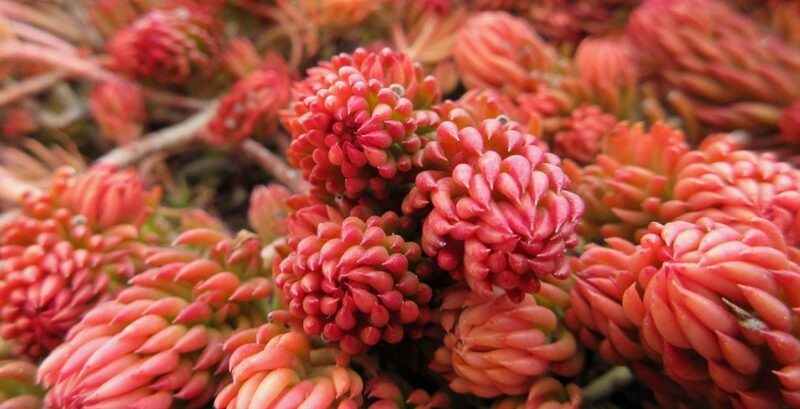 For starters, nearly every part of the plant is edible at some point during the year. The rhizomes can be consumed year-round but are best from fall to early spring. They can be roasted, boiled, grated, ground, or dried and milled into flour. Starch collected from pounding and boiling the rhizomes can be used as a thickener. In the spring, young shoots emerging from the rhizomes and the tender core of the leaf bundles can be eaten raw or cooked and taste similar to cucumber. Young flower stalks can be boiled and eaten like corn on the cob and taste similar to artichoke. Pollen, which is high in protein, can be mixed with flour and used to make pancakes and baked goods, among other things. The seeds can be ground into flour or pressed to produce cooking oil. The cattails have made a suburb material for shelter in leaves that are long, water-repellent, and packed with closed-cell foam for insulation. … In dry weather, the leaves shrink apart from one another and let the breeze waft between them for ventilation. When the rains come, they swell and close the gap, making the [wall] waterproof. Cattails also make fine sleeping mats. The wax keeps away moisture from the ground and the aerenchyma provide cushioning and insulation. 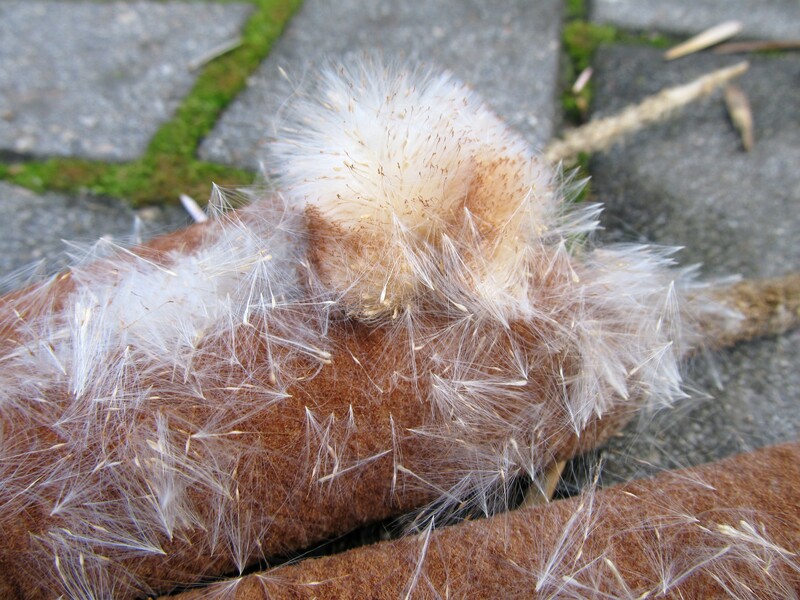 The fluffy seeds make great tinder for starting fires, as well as excellent insulation and pillow and mattress stuffing. The dry flower stalks can be dipped in fat, lit on fire, and used as a torch. Native Americans used crushed rhizomes as a poultice to treat burns, cuts, sores, etc. A clear gel is found between the tightly bound leaves of cattail. Kimmerer writes, “The cattails make the gel as a defense against microbes and to keep the leaf bases moist when water levels drop.” The gel can be used like aloe vera gel to soothe sunburned skin. This entry was posted in Botany, Plant Ecology and tagged cattails, ecology, edible plants, ethnobotany, habitat, inflorescence, John Eastman, marshes, medicinal plants, My Side of the Mountain, native americans, plant ecology, pollen, Robin Wall Kimmerer, seeds, Typha, wetland plants, wetlands. Bookmark the permalink. ← Happy American Wetlands Month! Flagging. Can someone explain it to me.